Let's be honest, ample square footage is a very nice problem to have in a bedroom. But for those of us who are square footage challenged, that doesn't mean we have to make do with cramped, cluttered, borderline claustrophobic boudoirs. No matter how "cozy" your room might be, it's important that you feel comfortable — your bedroom should feel like a private oasis regardless of its size. 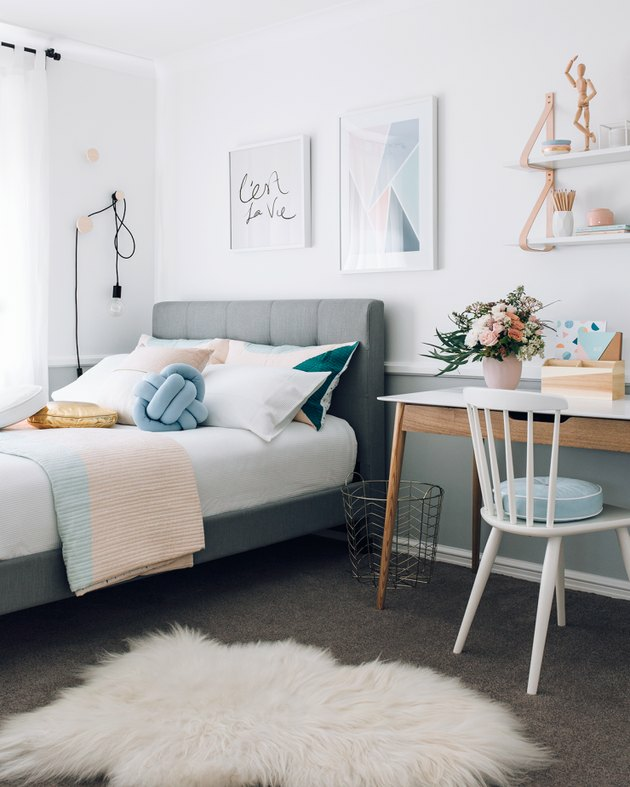 Even if your space is barely large enough for your bed, we have 15 cool ideas that will make your bedroom look and feel bigger. 1. 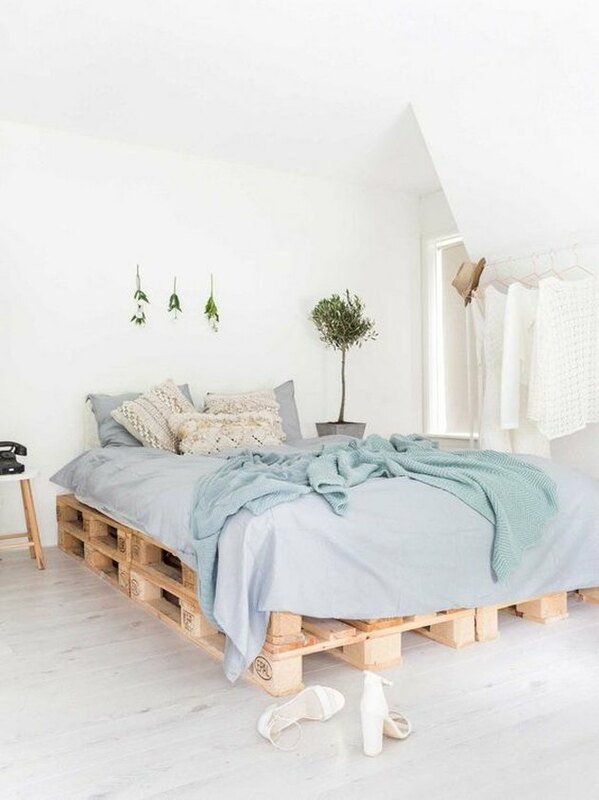 Loft-style beds aren’t only for dorm dwellers. For some, loft-style beds conjure childhood memories of summer camp. However, cramped city living has seen a resurgence in the adolescent bunk. Not only is this sleeping arrangement kinda fun, but opting for the lofty design, allows you to utilize the space below for more important things than dust bunnies. 2. Bed placement is crucial. More often than not, your bed is the largest piece of furniture in your bedroom. As a result, its placement is the most critical decision you have to make when putting your cozy room together. Try out a few different arrangements to get a feel for which one works the best for you, and more importantly, appears to give you the most space. Also, consider your electrical needs and the location of the outlets, as well as window placement. 3. Tear down those pesky closet walls. Have you ever thought to yourself, "If I could only remove this wall, I would have so much space?" Well, you're not alone. An enclosed closet can eat up a significant portion of your limited square footage. So if you own your home, or have a super cool landlord who is willing to let you stretch your design savvy muscles, consider tearing down those walls to create an open wardrobe. Pro tip: Before you start swinging the sledge hammer, make sure you do not touch any structural or load bearing walls. Bulky, closed cabinets or stacks, on stacks, on stacks of dusty books piled in the corner can make a room feel confined. 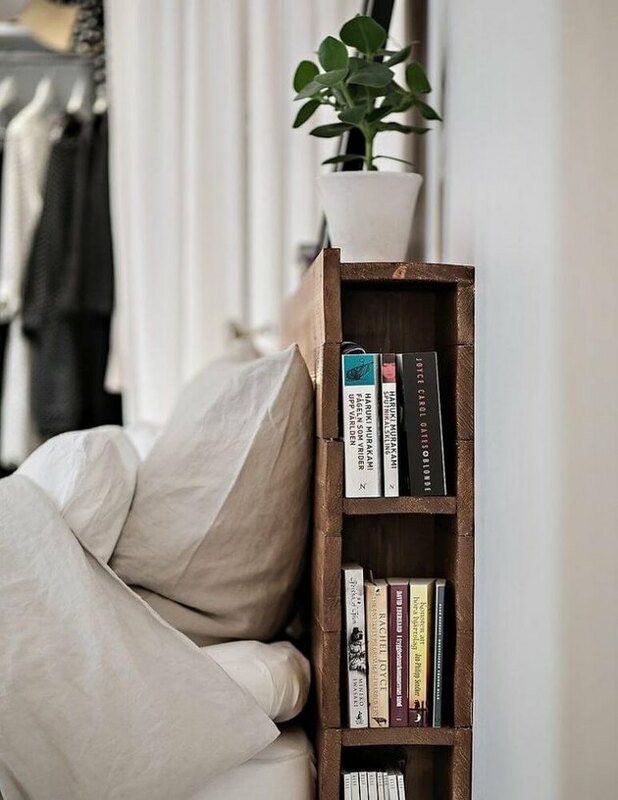 Open up your space with shelving that shows off your eclectic book collection and treasured tchotchkes. 5. Opt for a smaller bed. Although rolling around in a California king is nice, it's not necessary for a good night's sleep. Consider downsizing to a smaller bed in exchange for a little extra space to squeeze in that desk you've had your eye on. 6. Don’t be afraid of dark walls. Instead of trying to trick the eye — embrace the coziness of your very small bedroom. 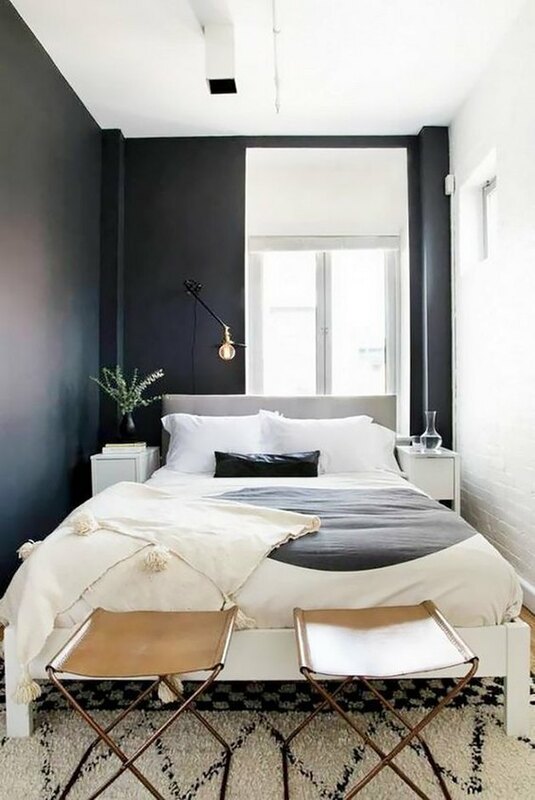 Consider a rich, dark-colored wall paint. Not only will it look amazing, but the calming effect might also contribute to better sleep. And who doesn't want that? 7. For studio spaces, replace walls and doors with glass. If you live in the city, you might be tempted to divide your studio apartment by building a wall. 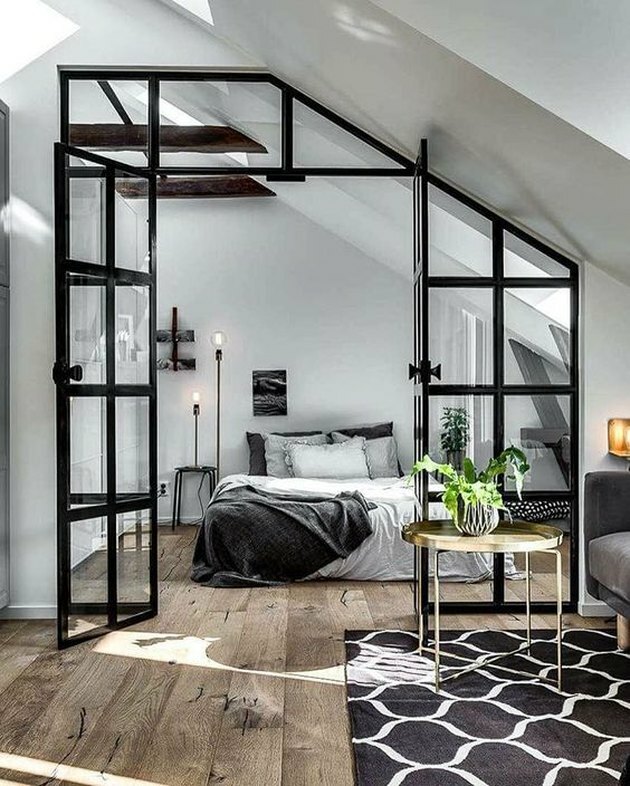 But before you finalize your floor plan, consider adding steel factory-style French doors and windows, instead. The industrial aesthetic, reminiscent of a greenhouse or factory, allows for a bit of privacy without sacrificing the openness and continuous flow of the space. 8. 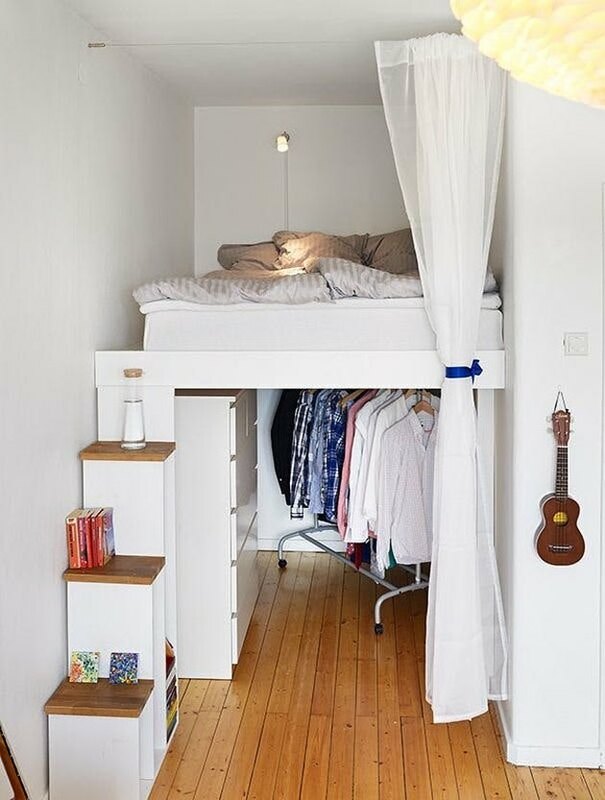 Utilize storage opportunities under the bed. From winter clothes to old journals, there are plenty of items that we own that don't require easy access. And what better place to hide these trinkets than under your bed? By taking advantage of this under-utilized space, you can increase your storage while decluttering your room. It's a win-win! 9. ...and in your headboard. A small bedroom means it's time to get creative. Think outside the box, or in this case inside the headboard, for unique storage opportunities. Search high and low for nooks and crannies — you might be surprised at all of the space you find. 10. Keep your bed low to the ground. Not all of us are fortuitous enough to wake up to high ceilings. Luckily, we can create the illusion of a higher ceiling by keeping furnishings, such as a platform bed, close to the floor. 11. Maximize opportunities for storage above your bed. 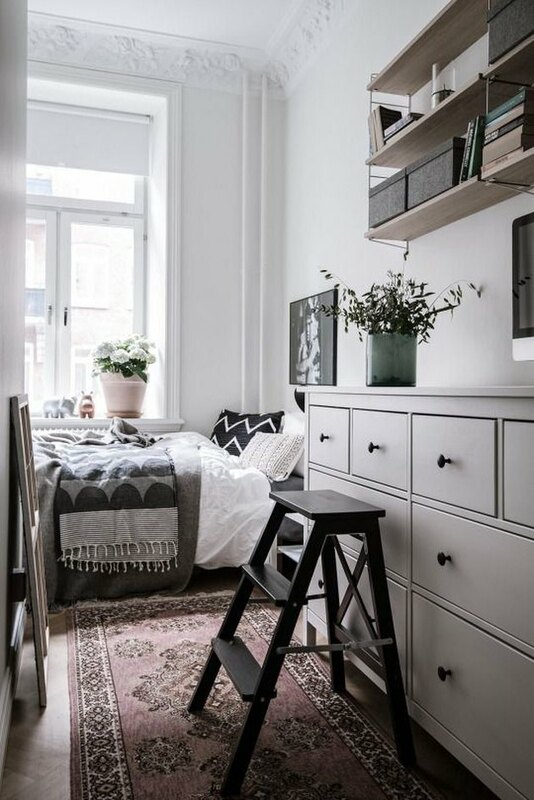 In addition to creating the feeling that your bedroom has a higher ceiling, a low platform bed can also give you a little extra room for storage above your bed. 12. 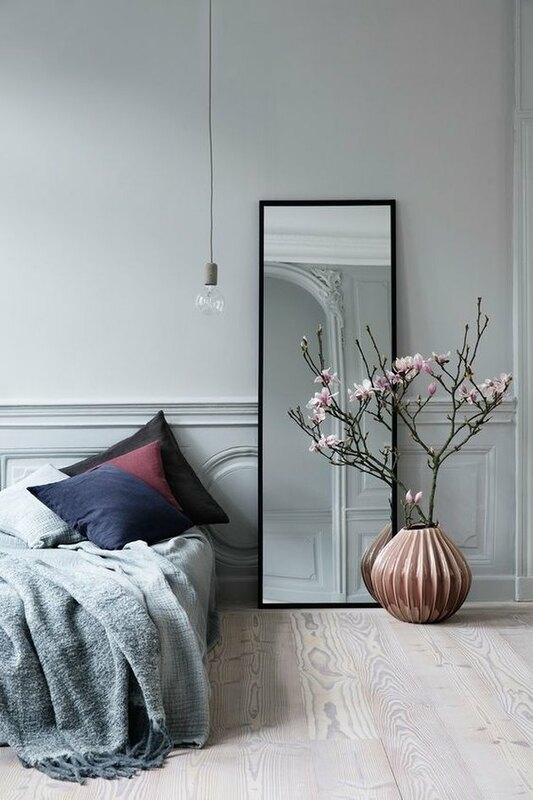 Use mirrors to create the illusion of an expanded boudoir. You might have heard the rumor that mirrors can give the illusion of more space. Well, good news: This is not just a rumor, this is actually true. 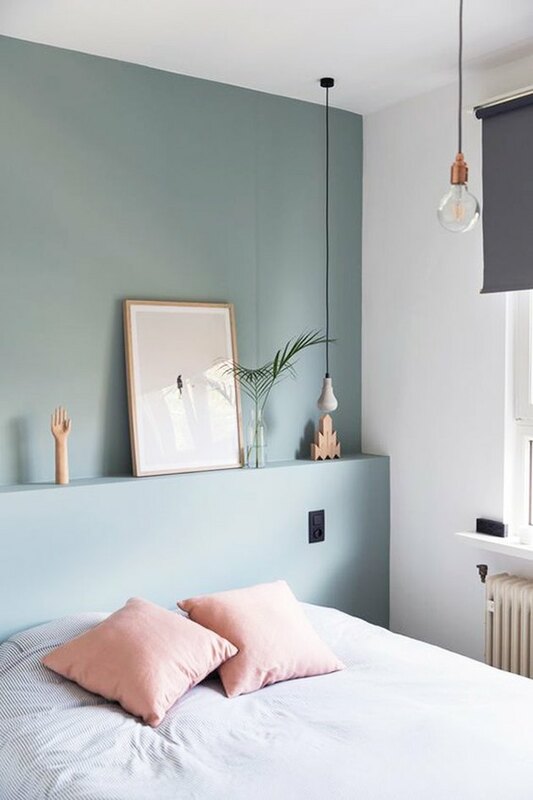 To multiply this visual effect, paint your walls in a light-colored hue perfect for reflecting all of the natural light that pours through your bedroom window. Dark-colored carpet or wood flooring can cause a room to feel dull, gloomy, and even claustrophobic. 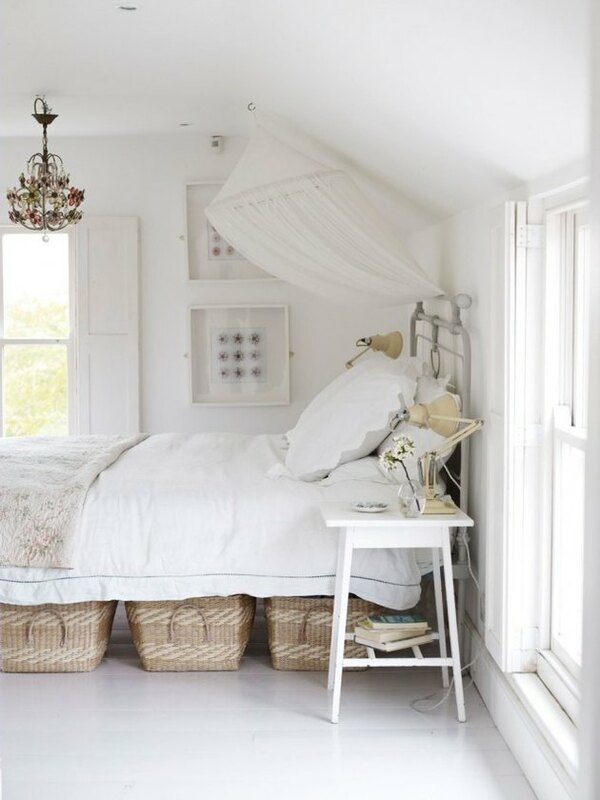 Increase your bedroom's bright luminosity by opting for light-colored flooring instead. 14. Create your own closet space. 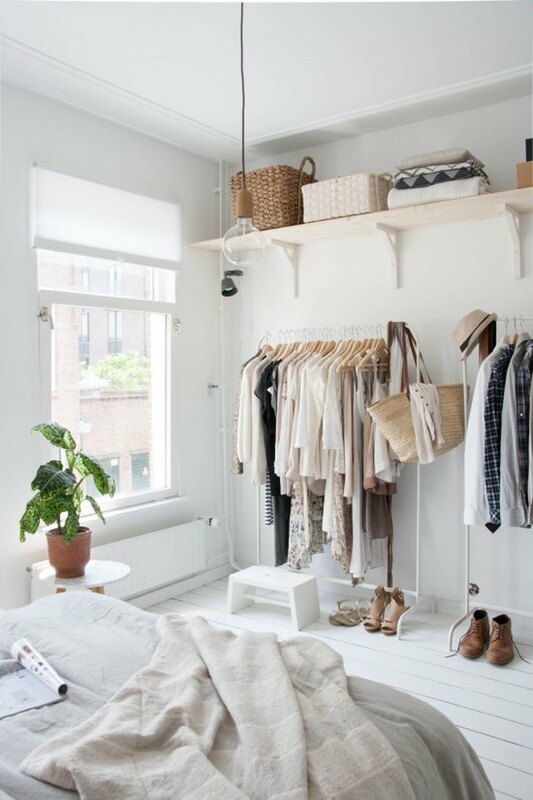 Tearing down your closet walls to create a little extra space is a great way to bypass square footage constraints. However, if you'd still like to keep your closet somewhat hidden, installing ceiling mount drapery might prove to be an ideal solution. 15. 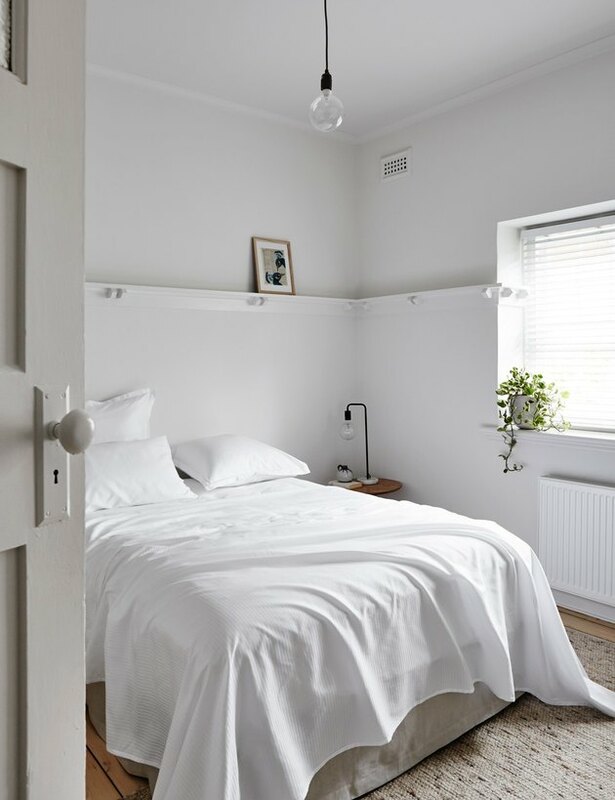 Minimalism is a small bedroom's best friend. 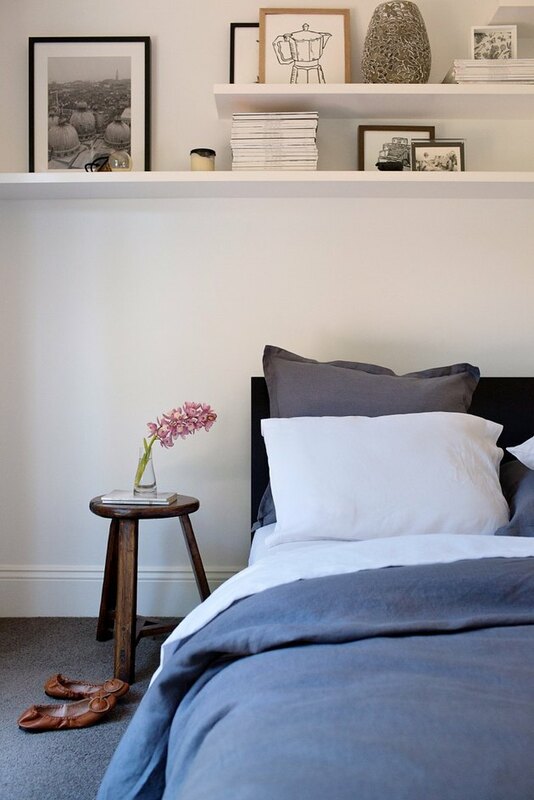 Don't cramp your small bedroom's style with an overabundance of stuff. Streamline your boudoir by purging all of the things you absolutely don't need, creating a more minimalist look, and you will be amazed by how much larger it feels.